Friendship holds a lifetime of importance in everyone’s life. 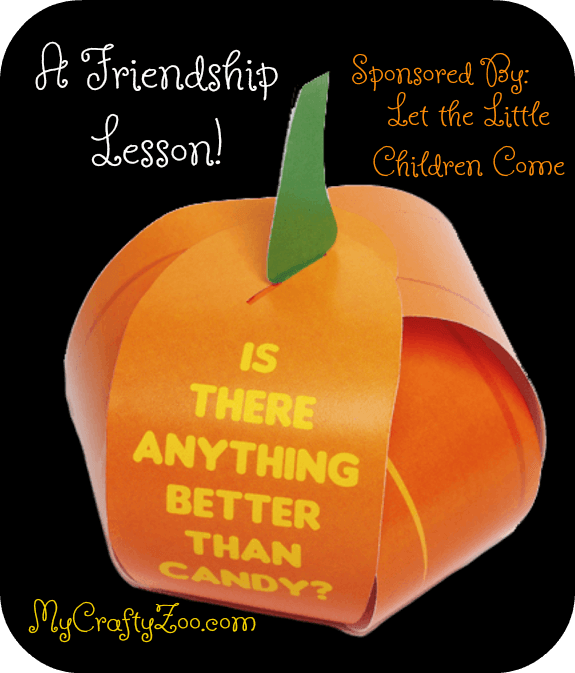 This lesson helps to teach friendship so that children understand it better than ever! If you’ve never enjoyed the challenge of teaching children week after week, you may not quite get how big of a challenge it is. However, if you have children you definitely get it. Whether you are looking for non-scary ways to celebrate Halloween with your children or simply want an alternative to the traditional, I’ve found a great Halloween Tract to ‘hand out’ or just to get to teach your own children. Let the Little Children Come has some awesome products, I especially love these little pumpkins they have! This little craft product has so many great lessons! Is there anything better than candy? With the inside of each panel of the pumpkin comes a message that s essential for our children and ourselves! It can be a challenge to come up with new and interesting projects. This one is perfect for Halloween, Thanksgiving, or anytime for the Fall! Perfect time to get yours ordered so that you are ready when September gets here! Good friends listen to each other! Have the children take turns with a ‘friendship item’ telling one thing they like about themselves. This has two purposes; it builds the child up while teaching the children to find good things about others. Next, ask the children to say something they like about another child. In order to avoid everyone picking the same person, I suggest having the sit across from one another; definitely consider splitting up the children from their ‘normal’ group of friends, and having them pick something about the child across from them. Making this quick and fun will help ensure that the kids maintain attention. As you begin a craft or some other fun project, challenge the kids to try extra hard to listen to what people say when they speak. You have no planted the best seed to help the children get on track to listen to others! This little game goes perfect with the adorable little pumpkins featured and they are the perfect Segway into the lesson taught inside each side of the craft. There are so many wonderful ways this fun little game can teach valuable lessons! Looking for more great lessons for the little ones? Or for the little one in you? Check out what optical illusions can teach you! If all this fun doesn’t lower your stress, this will so have some fun and enjoy life!